Potato starch often appears in gluten-free recipes as a thickener instead of flour. It's not always common at the grocery store, but you can make your own at home. 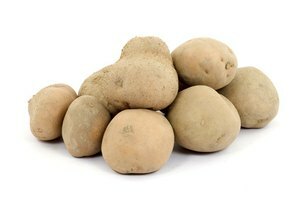 The amount of starch this process yields varies with the age and type of potato used. 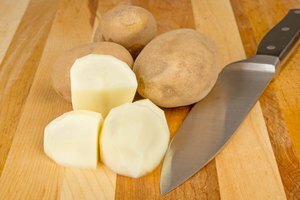 For the best results, use a large, high-starch russet potato. Line a colander with two layers of cheesecloth, and place the colander over the bowl. Grate the potato, using the smallest set of holes on the grater, into the cheesecloth. Fold the ends of the cheesecloth up and over the potatoes to cover. Press down on the cheesecloth until the starchy liquid from the potatoes drains into the bowl. 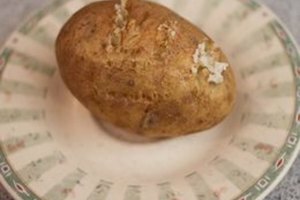 Open the cheesecloth and pour 1/2 cup of water over the potatoes. Cover again with the cheesecloth and squeeze the potatoes to drain into the bowl. Repeat steps 5 and 6 with the remaining 1/2 cup of water. Place two cans on top of the cheesecloth and leave them for 1 to 2 hours to squeeze more starch from the potatoes. Remove the colander and discard the cheesecloth with the potatoes. 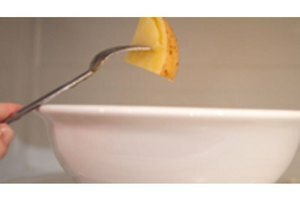 Carefully pour the liquid into a separate bowl without disturbing the starch that has settled at the bottom of the first bowl. Discard the liquid and let the remaining potato starch dry before using.